It may seem a stretch to compare page design with architecture, but the comparison really works, I think. Looking at the medieval page, it is not difficult to regard it as an engineered construction: a convoluted space defined by columns and corridors, with rooms inhabited by thoughts and ideas (Figure 1). Nothing encountered on the medieval page is a coincidence. Everything is there for a reason and serves a specific purpose; and so, too, is the manner in which the text was spread out over the page. Like other material features of the manuscript, page design is usually reflective of how the book would be used, but in their choices scribes also responded to the preferences – demands, even – of the individuals who would ultimately use the manuscript. Readers, in turn, preferred their books – and the pages in them – to be formatted in certain ways because they planned to use them for performing particular tasks: to educate or be educated (teachers and students), to entertain or to be entertained (minstrels and courtiers), or to gather a body of information and consult it (scholars, preachers, physicians, lawyers). How and where words were placed on the page – their size and script, and their location – were important considerations in this process of turning the book into a tool that was up to the task. Indeed, it can be argued that a page’s design was (and is) key to a book’s success. What are some of the variables in play? And how did the choice for a certain design affect, positively and negatively, the manner in which the medieval book could be used effectively? If the page is a building, its foundation was laid in an early stage of a manuscript’s production. After the scribe had figured out how to tackle a particular book – he knew how it would be used, having had input from the patron or the monastery’s librarian – he would start designing the page by grabbing two tools that were fundamental for what the page would ultimately look like. The first was a pointy device that allowed him to punch holes in the parchment or paper leaves, which appear like dots along the long edges of the book. The second was a tool with which he could add ruling to the page. Up to c. 1150, a sharp object was used to produce gutters – indentations in the parchment – which created pathways for the lines of text flowing out of the pen. After that date a piece of lead or a pen and ink produced the ruling (this miniature shows a scribe using a ruler to produce the ruling; at the top of this post is another). 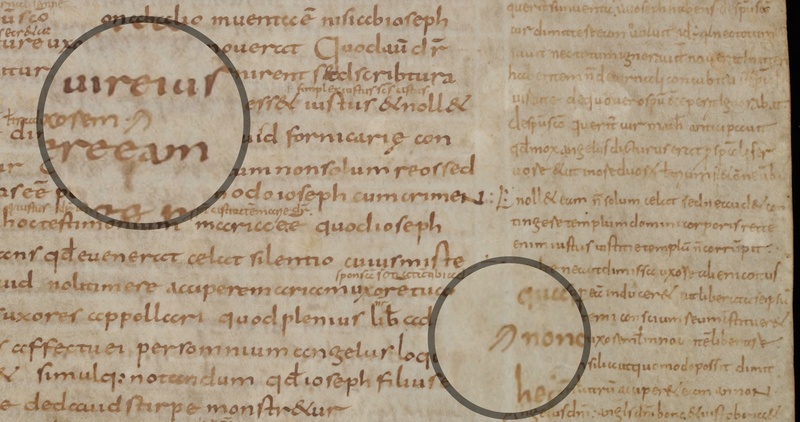 Connecting the dots in this fashion, the scribe placed a web of lines on the page (Figure 2). The resulting grid formed the outline of the future text: it defined – and confined – the number and location of the columns, the number of lines they would hold, as well as the dimensions and positioning of the four margins. 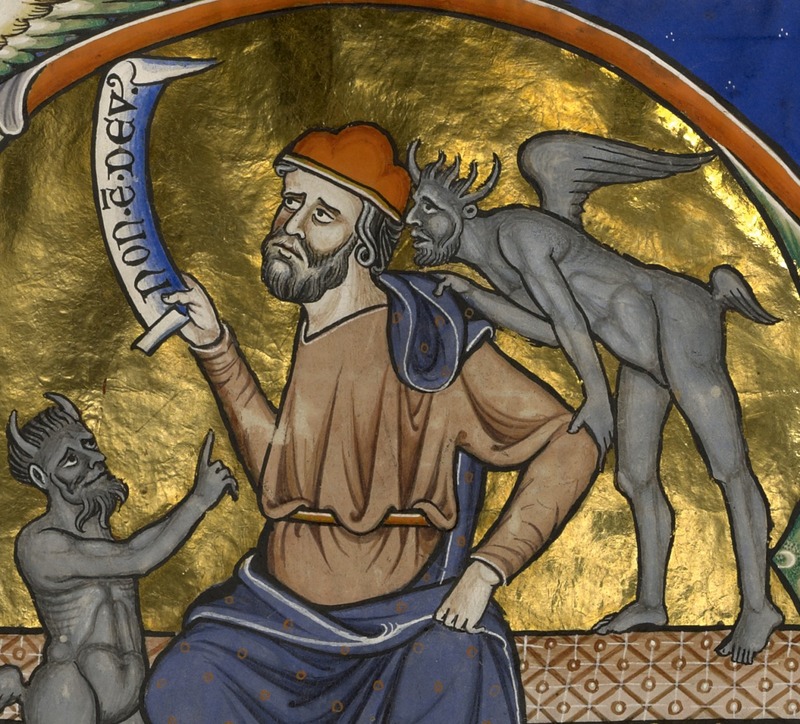 Even the ultimate presence of reading aids was construed during this early production stage. 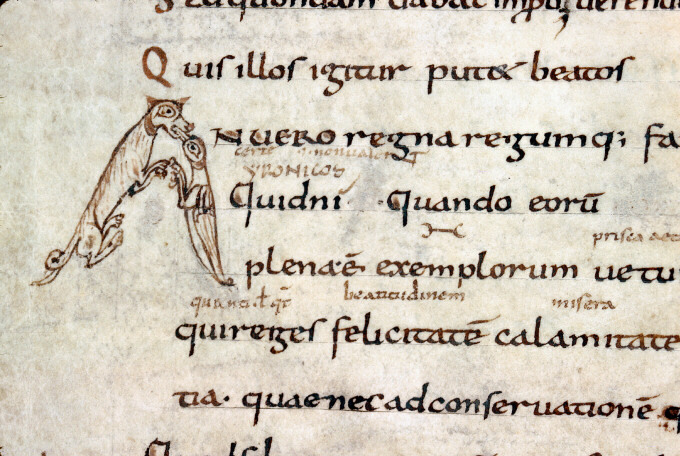 An extra line was added in the upper margin to guide the running title, if one was planned, while in preparation for marginal commentaries extra ruling was added to the marginal space (both not present in Figure 2). In a way this grid of horizontal and vertical lines functioned as the blueprint of the manuscript: it defined the ultimate page even before a single letter was written down on it. The still empty lines, yet to be complemented with words, determined what the book would look like and how it could be used later. The quill would bring this blueprint to life: it placed words onto the ruling, thus producing text and meaning. The main text of the book could be flanked by commentaries, which in turn formed additional columns. When several commentaries were present, the design of the page can be quite daunting – and must have been a nightmare to produce (see for example Figure 1). However, this complexity is relative. 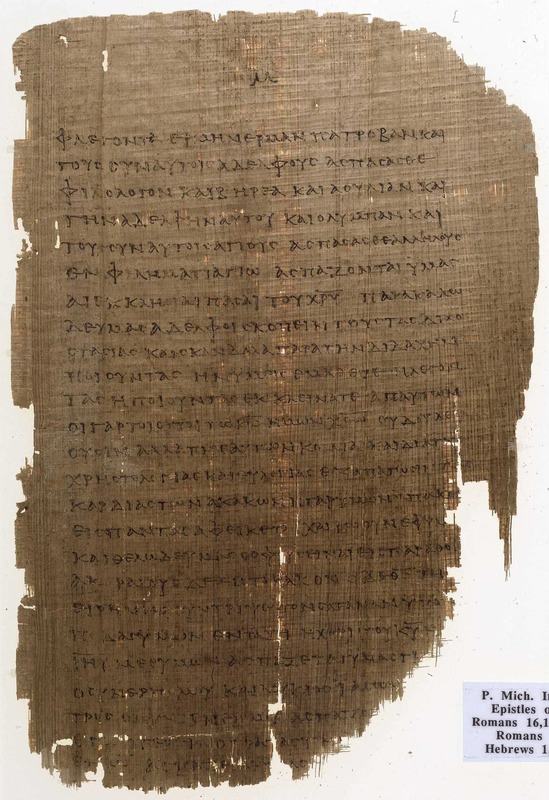 The example in Figure 3 shows a central text column, written in a large letter and deep-dark black ink, which contains the biblical text (the page shows St Paul’s Letter to the Galatians). Around it, in equally dark ink, Peter Lombard’s commentary to St Paul’s letter is encountered. This part was produced in Paris during the second half of the 13th century and illuminated in the Du Prat workshop (source). The margins around this text and commentary remained empty until 1412, when an additional commentary by Peter Tarentasia was added to the page in a smaller script. The result is a complex page, but also a remarkably organised one. After all, the information was placed in relatively isolated text compartments – “rooms,” as it were – which were separated by blank corridors. In other words, it was crystal clear to the reader what was what: the larger size of the letter identified the main text, while the smaller script of the commentaries as well as their positioning on the page, identified the occupants of the other rooms. Complex manuscripts like these, which present a textus inclusus or “square-bracket” glossing pattern, contain pages inhabited by a maze of corridors, which “snake” between the columns and sometimes even underneath or above them. 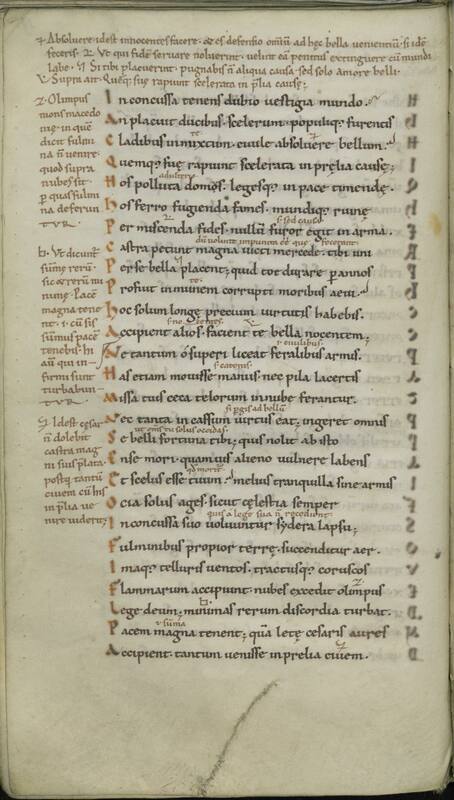 The manuscripts in Figures 1 and 3 are so complex that it is difficult to say how many text columns they consist of. Evidently, however, in both cases the main text is copied out in a single column, a firm pillar written in a bold letter. 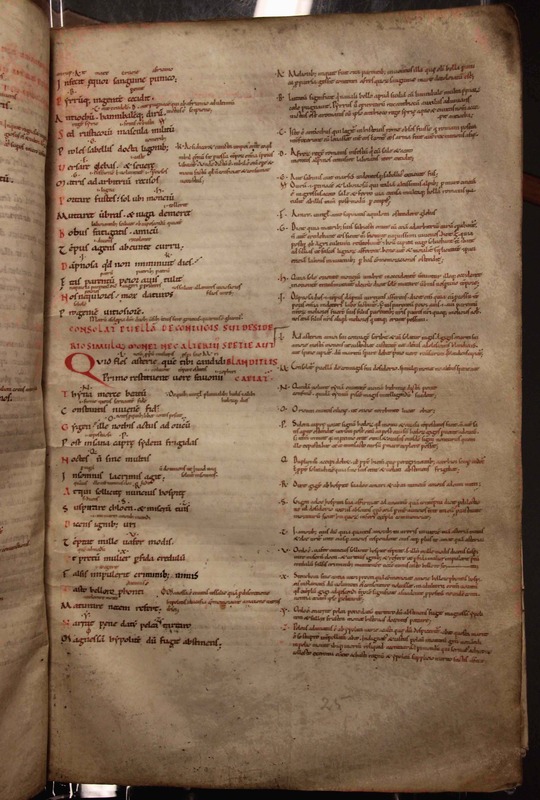 Most medieval manuscripts hold either one or two columns of main text. Three or four are occasionally encountered. Usually it concerns a dictionary or encyclopedia (read about an example of four columns here). A page with more than four columns is extremely rare. In fact, I only know of one such manuscript (Figure 4). It is kept in Amiens and holds a concordance of the Bible, a tool that enabled readers to identify where in the Bible certain concepts and figures were mentioned. 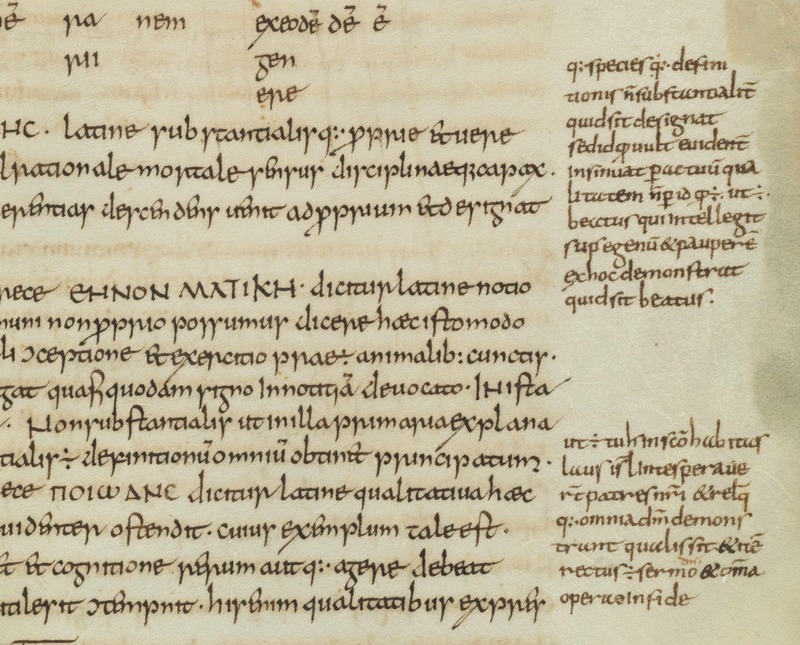 The entries in this manuscript – often a name followed by a bible book and a chapter number – are short, which is why the scribe decided to place five of them on a single page. The book measures 310×208 mm and is thus not even unusually large, which tells you just how small the script is. Equally remarkable, the page has room for a sixth column, which is crammed into the outer margin. Here the reader could add remarks; one was added on the spread seen in Figure 4, all the way in the top left corner. 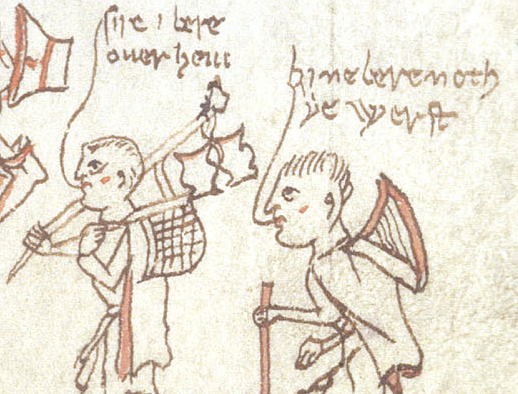 In the lower margins, too, there is room planned for comments. A grid of square boxes is seen here, produced by pencil lines. This is a popular design for university textbooks, which contain many such penciled squares, sometimes over forty of them on one page. 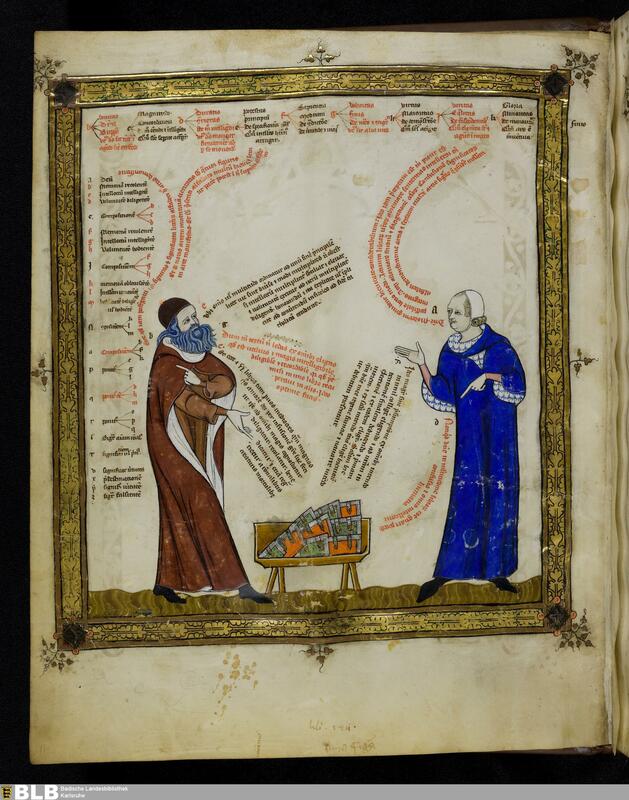 They act as comment boxes in which the student could jot down his notes (this is an example of such a manuscript; more about this practice in this blog post). The page as a house, the scribe as its architect: they are attractive comparisons, which highlight just how much an effective page depended on crafty design, careful planning, and meticulous calculations. Like an architect, the scribe made sure to create a comfortable home for future inhabitants. Raymond Clemens & Timothy Graham, Introduction to Manuscript Studies (Ithaca/London: Cornell University Press, 2007), pp. 14-17 (“Preparations prior to writing”). Discusses layout and the preparation of the sheets. Erik Kwakkel, “Decoding the Material Book: Cultural Residue in Medieval Manuscripts,” in The Medieval Manuscript Book: Cultural Approaches, ed. Michael Van Dussen and Michael Johnson (Cambridge: Cambridge University Press, 2015), 60-76. Discusses the rationale behind the choice of a manuscript’s materials features. Erik Kwakkel, Books Before Print (Leeds: Arc Humanities Press, 2018), pp. 30-70 (“Filling the Page: Script, Writing, and Page Design”). Overview of page design through case-studies. Elaine Treharne, “The Architextual Editing of Early English,” in A. G. Edwards and T. Takako (eds. ), Poetica 71 (2009), 1-13. Architectural context used as a metaphor in the editing of medieval texts. Margins are both a universal and remarkable feature of books. From the very earliest specimens produced two millennia ago, to the e-readers we use today, books contain pages that hold both text and a significant amount of blank space. What a strange pair they are: words, the primary reason for the book’s existence; and a vast emptiness present on all sides of the text. A particularly remarkable aspect of marginal space is that there is so much of it in medieval books. My own work on the twelfth century, reflecting broader medieval patterns, shows that pages from that period consist of approximately 50% margin, although in some cases it can be significantly more. This implies, astonishingly, that the majority of medieval books are half empty, despite the fact that parchment was expensive and sometimes even hard to come by. Why is this? One answer to this question is a simple one: because this is how books were traditionally made. 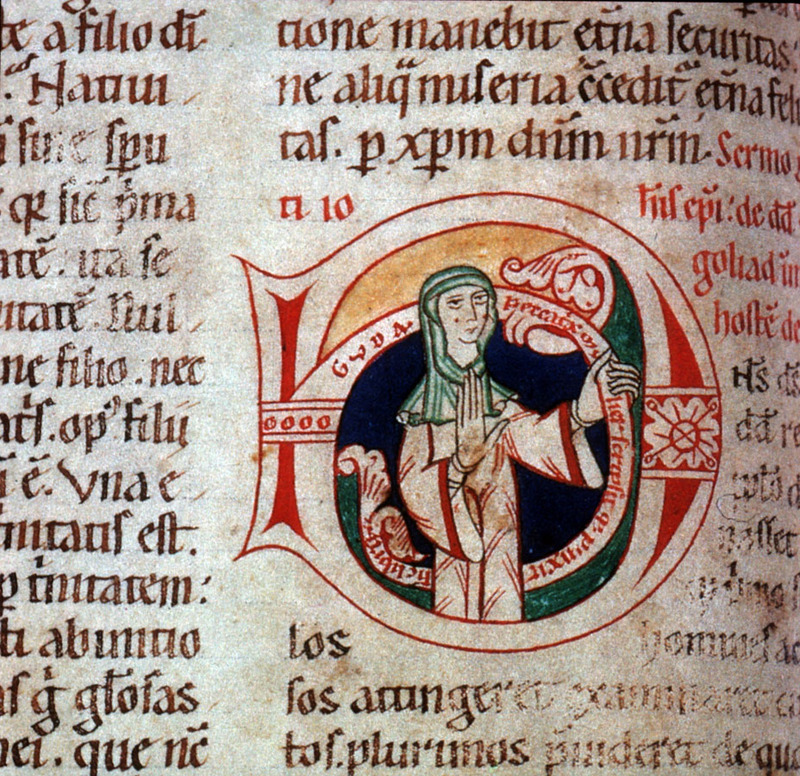 Medieval scribes took over a great deal of material features first introduced by their counterparts in Antiquity. The book as we know it – i.e. an object produced from quires (bundles of folded sheets) – came into existence in the fourth century, as discussed in my post What is the Oldest Book in the World? 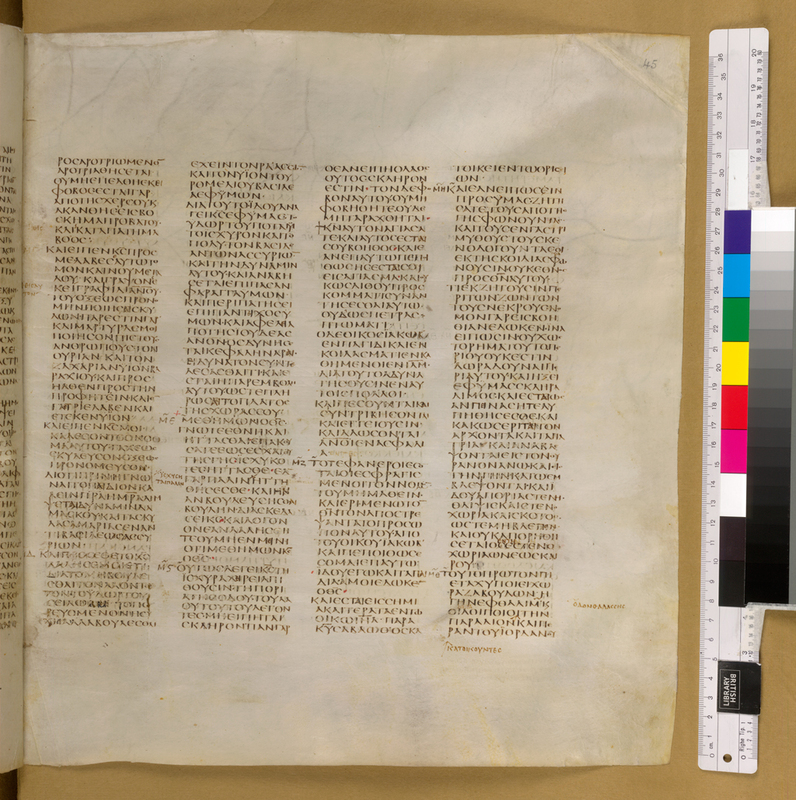 The pages of the famous Codex Sinaiticus, a Greek New Testament copied around the middle of the fourth century, measures 381 x 345 mm (height x width), while the text itself only takes up 250×310 mm (height x width). A simple calculation reveals that the text takes up 58% of the page, while 42% is reserved for the outer margins. In other words, a little under half of this magnificent book is empty. Going back even further, papyrus manuscripts from Antiquity also included a considerable amount of marginal space. This is seen, for example, in Fig. 2, which shows the remains of a copy of Paul’s Epistles written between 150 and 250 CE. While the margins have been reduced post-production through damage (the edges of the papyrus eroded), the upper margin, which is largely intact, shows how the scribe reserved ample marginal space. 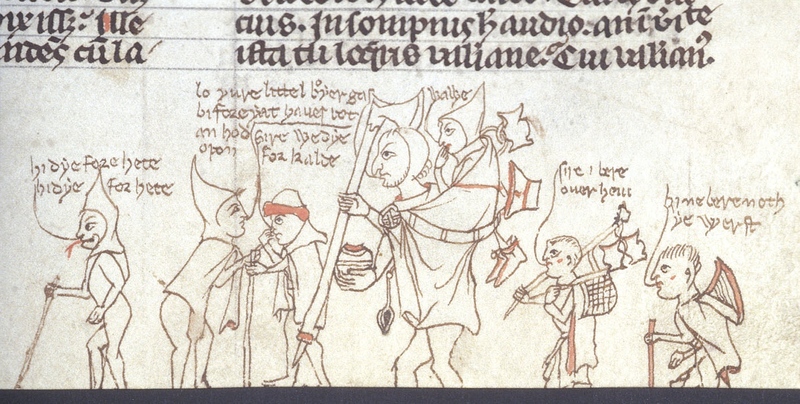 The extensive medieval margin is, in one way, simply a continuation of an older practice. The early papyrus book in Fig. 2 highlights that it was also convenient to have an empty space around the text. It meant that you could fill them with tools that may be helpful when consulting the book. 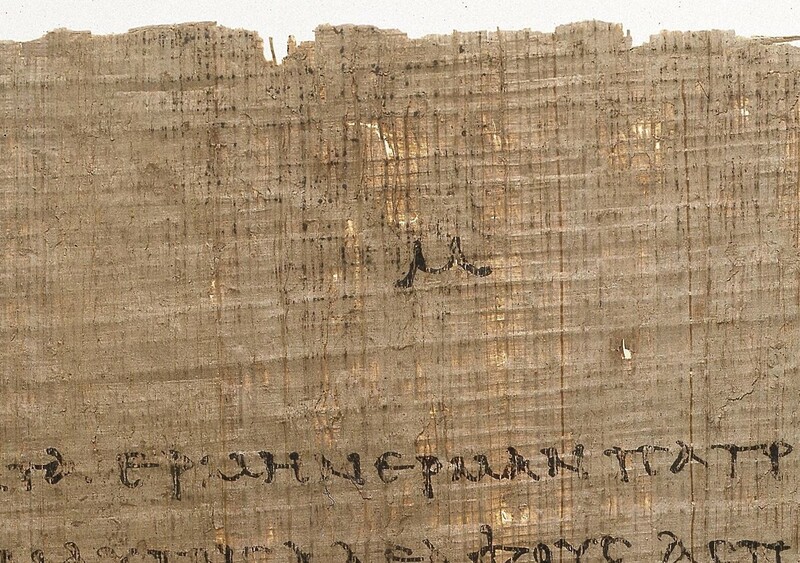 A particularly important reading aid is visible at the top of the papyrus page: the capital version of the Greek letter Mu (looking like an M), which represents the Greek number 40 (Fig. 3). In other words, this is a very early page number (folium number), an instrument that is apparently some two thousand years old and predates the printed book by over a millennium. There are many other kinds of aids encountered in the margins of medieval books, including cross references to other books or locations in the same manuscript, quotation marks, labels that indicate who the quoted author is, and chapter numbers. A particularly prominent aid is the running title placed in the upper margin. The one in Fig. 4 states “Physicorum”, indicating this is Aristotle’s Physics. This particular manuscript contains several Aristotle texts, which were popular in the university classroom. The student or teacher who was browsing through the book for certain information was greatly helped by these sign posts. While the margin did a good job accommodating the relatively short reading aids, it could be challenging to add large amounts of text to the void surrounding the main text. Fig. 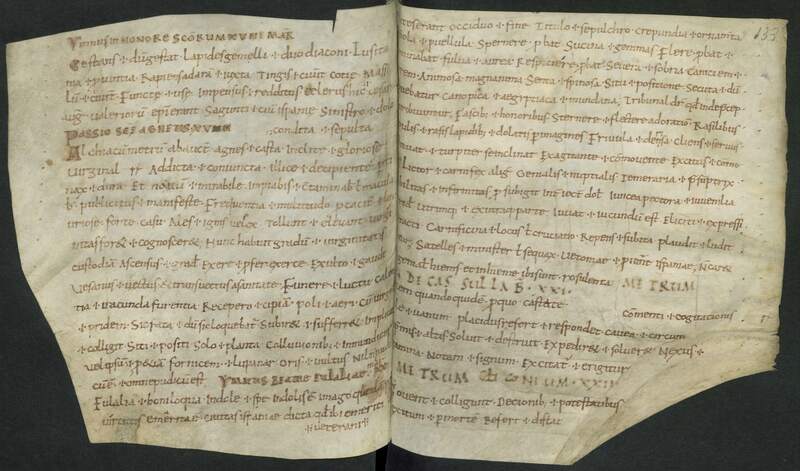 5 shows a schoolbook from c. 1100 that was donated to Egmond Abbey near Amsterdam by one Baldwinus, a teacher in Flanders. 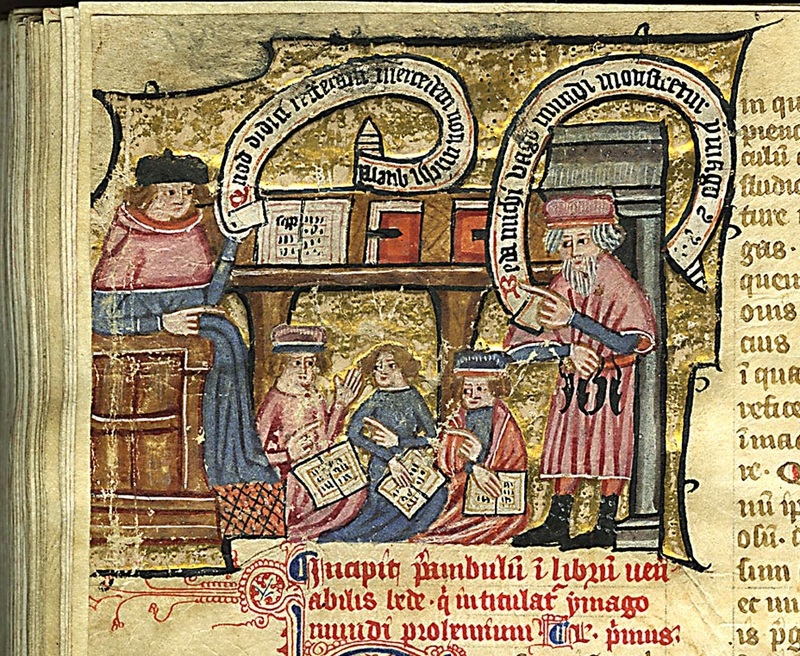 The text in the book, Lucan’s Pharsalia, was used in the medieval classroom, and it is therefore no surprise that numerous explanatory notes have been added to the text, probably by Baldwinus himself. 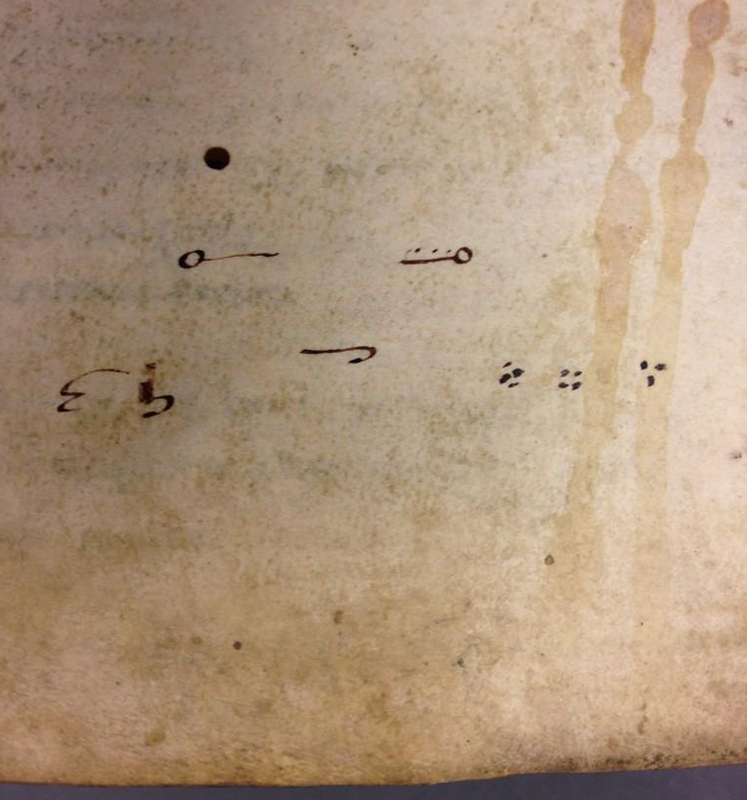 There is something special about these marginal notes: they are preceded by symbols that are the precursor of our modern footnote (more about this early practice in this post). The symbol links a remark in the margin to a specific location in the main text. The symbol seen in Fig. 5 resembles the number 7 and is perhaps the Tironian note for “et”. Despite these add-ons, the schoolbook from c. 1100 is not really prepared to hold extensive notes. Baldwinus could have crammed more text in the margins, had he copied in a smaller script or increased the number of lines for the marginal text passages (presently, their number corresponds to the main text). However, this was not yet common practice in his day and age. In the scholastic age, by contrast, when university students needed to add a lot of extra information in the margin, these two tricks were applied, as seen in Fig. 3 – note the tiny script of the marginal notes, as well as the increased number of lines compared to the main text. The examples in this post have shown different ways in which the margin, that handy device inherited from Antiquity, was put to good use by scribes and readers. However, it has not discussed why medieval margins were so large. Why keep as much as half of the page blank? Surely a quarter would be sufficient to add notes or tools? While there are manuscripts that exhibit pages with tiny or no margins, there are not many. Leiden University library owns one of these exceptions: an early-eleventh-century schoolbook made from scrap parchment, the pages of which were filled to the brim (Fig. 6). Interestingly, the teacher who copied this book diverted from the medieval convention related to page design in that he opted not to add substantial blank spaces. His use of scrap parchment (offcuts that were left over after the regular sheets were cut from the animal skin) indicates this was a low-cost book project. In other words, making maximum use of the available space on the page is likely motivated by cost considerations: it ultimately limited the number sheets necessary to copy this collection of (classical) texts. While the choice for large margins may have a basis in a shared idea of perfect proportions, something modern book designers would call the “golden ratio” (see here, here and here), the notion of convention is probably the ultimate drive. There are plenty of conventions in medieval book production that don’t have an obvious explanation. 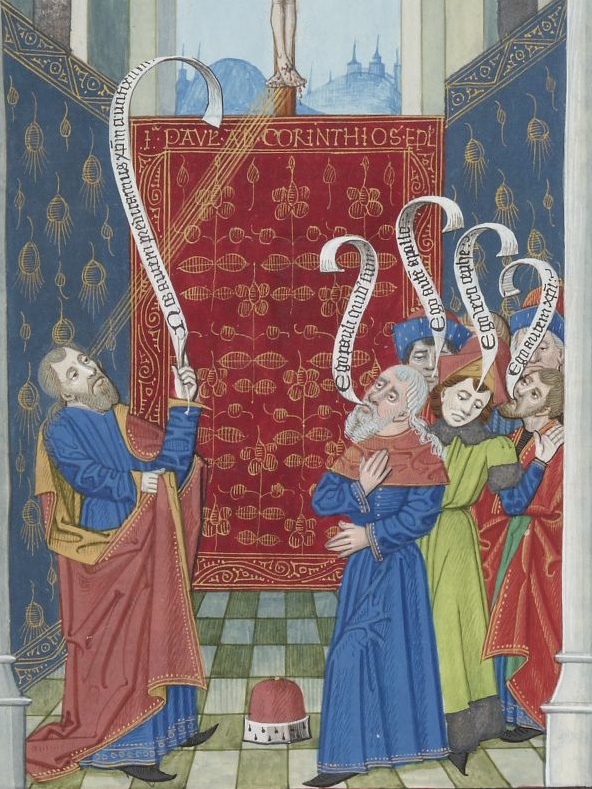 The relative dimensions of the page is one of them: the width of medieval books tends to be about 70% of its height (see my Books on a Diet post for some curious exceptions), but why is this so? And why do quires predominantly consist of four folded sheets? Why are page numbers placed in the upper rather than lower margin? The bottom line is that large margins may simply have been something that medieval readers had come to expect from the object in front of them. 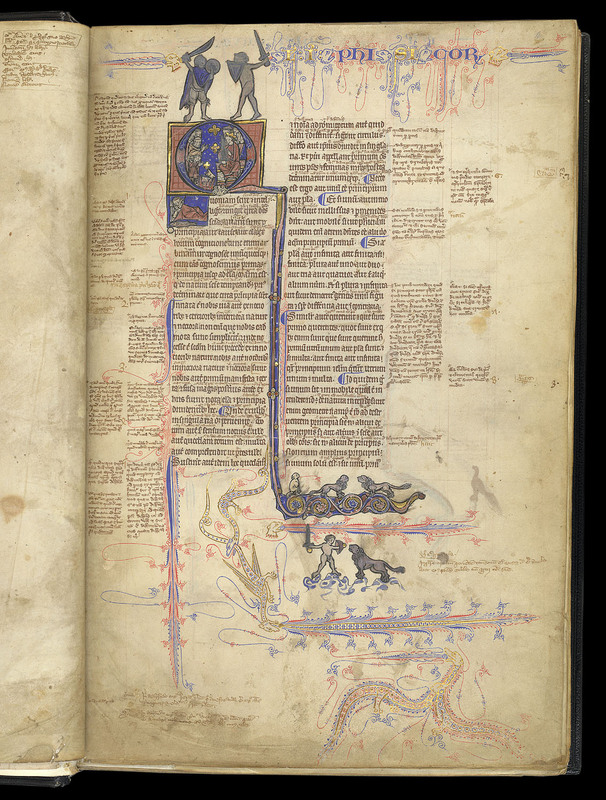 Postscriptum – This post was written in celebration of a conference devoted to the medieval margin, which I attended in June 2015 (details and abstracts here). More on the unusual Leiden scrap manuscript in the essay I wrote for this volume. Also make sure to check out this blog by the Marginal Scholarship project. I owe the title of this post to Julie Somers.